GammaX | ProMinent Fluid Controls, Inc. 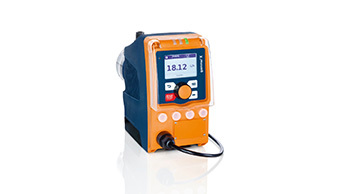 The new gamma/ X is the first metering pump with predictive intelligence. Thanks to its controlled solenoid drive with sensor-free pressure measurement, it detects hydraulic faults even in the case of minimal deviations – immediately and optimally matching its output to the pressure conditions and properties of the medium while protecting the pump and piping systems from overload situations. diaphragm rupture sensor input and control cable input. is recommended and pumps supplied with ½” MNPT connections. * The given performance data represents guaranteed minimum values, tested using water as the medium at room temperature. All data refers to water at 68 °F. Auto degassing liquid ends in NP with a valve spring of Hastelloy C and PVDF valve insert. PVT7 versions with PVDF / PTFE wetted parts.